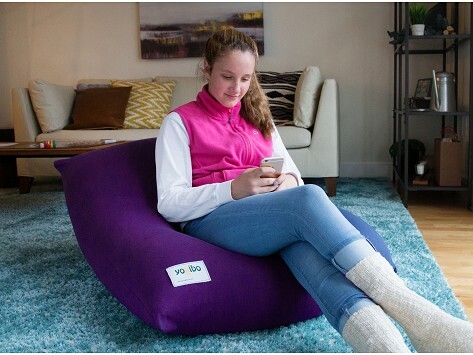 The Mini is a bean bag chair suited for any room in the house. Its near-frictionless beads are packed in a soft spandex fabric that stretches and conforms to your body. Plus, the cover is easy to unzip and machine wash. Once you’ve sunk in, there’s no going back. Dimensions: 36" x 36" x 24"
Second one.The only problem that I had was with opening the zipper,I was unable to open it. It may resemble an old-school bean bag chair—but it definitely doesn’t feel like one. A Yogibo has zillions of beads, like its 1970s predecessors. But these near-frictionless beads are wrapped inside a soft spandex fabric that conforms to your body like a hug. After the success of their loungers (which are a hot commodity here in our office), Yogibo found that their brand of beads would be at home other places, too. Now you can sink into soft body rolls, support pillows, and cushions that use the same homey formula. Dorms, kids’ bedrooms, rec rooms, and family rooms—Yogibo is at home anywhere. The only place you won’t find one is banished in a corner. It’s just too irresistibly comfy.